To celebrate the new and exciting 2019 Corvette Dream Giveaway brought to you by Lingenfelter Performance Engineering, we’re giving away two of the most collectible Corvettes ever made. Are you ready to win both of these matching muscle machines, plus $60,000 for taxes? This year’s grand-prize package starts with a 1961 Corvette convertible — a fully restored classic ride with the prowess and agility of a new Corvette. This restomod was built at a cost of nearly $200,000. This vintage ’Vette features exemplary fit and finish, drop-dead gorgeous design and unparalleled performance. 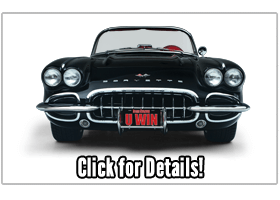 Enter to win and you’ll enjoy the movie-star good looks and top-echelon performance of this classic Chevrolet sports car. Turn the key and go! That’s the motto of this fully restored 1961 Corvette convertible. When you put this vintage Corvette in your garage, you’ll never have to worry about carburetors or fouled plugs again. That’s because this Route 66-era roadster is upgraded with a modern Chevrolet engine and transmission, brakes, wheels and air conditioning. Make no doubt about it. This is a once-in-a-lifetime classic Corvette with a no-expense spared restoration. 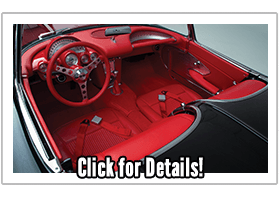 When you enter and win the 2019 Corvette Dream Giveaway, you’ll bring home this perfectly restored 1961 Corvette bathed in Tuxedo Black paint, adorned with a red leather interior and decked out with a four-speed automatic transmission, air-conditioning, power steering, power brakes, power windows, power hood and a whole lot of Corvette attitude. This specially selected 1961 Corvette convertible can be yours when you enter and win the 2019 Corvette Dream Giveaway. Keep reading because it’s only half the grand prize. Just wait until you see what comes along with it. 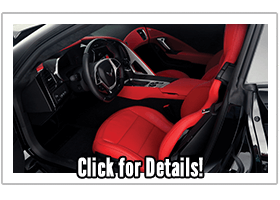 To help Dream Giveaway celebrate 12 years as America’s favorite car giveaway, when you hold the lucky ticket, you’ll also bring home a brand-new 2019 Corvette ZR1. The 2019 Corvette ZR1 is the fastest production car ever to roll of a Chevrolet assembly line. Specially built for the Corvette Dream Giveaway brought to you by Lingenfelter Performance Engineering, this go-fast, grand-prize Corvette ZR1 features Chevrolet’s new 755-horsepower supercharged small-block V-8 engine and lickety-split 8-speed automatic transmission. This king-of-the-hill Corvette incorporates select technologies born from Corvette Racing, extensive use of carbon-fiber, sophisticated aerodynamic configurations and a special-order Track Performance Package with extra-cost red brake calipers. Enter and win and you’ll have the time of your life keeping the world’s best competition in your rearview mirror. This grand-prize Corvette ZR1 is sure to be a future collectible. It sports an eye-grabbing Adrenaline Red cabin color as part of a top-of-the-line interior, which includes heated and vented Napa leather seating surfaces, Competition Sport seats, a leather-wrapped steering wheel with carbon-fiber rim, the Performance Data Recorder, Bose premium audio and more. This one-of-a-kind, seventh-generation Corvette also includes billet-aluminum Lingenfelter badges on the hood, a Lingenfelter badge on the rear fascia, red ZR1 emblems front and rear and Lingenfelter embroidered callouts on the integrated seat headrest covers. 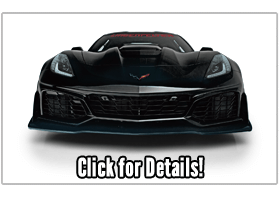 Enter and win the 2019 Corvette Dream Giveaway and you’ll put this 2019 Corvette Grand ZR1 and matching 1961 Corvette convertible in your garage. Plus we’ll pay $60,000 for the taxes and fly you to Clearwater, Florida, to accept the keys to both cars. Enter now.